High Definition Waterproof Zippers Product Pictures Are Provided By Us. It Will Take Some Time To Load. Please Be Patient. Thank You! The waterproof zipper is waterproof when it is raining or when it hits rain. The waterproof zipper is also used for seamless products. Waterproof zipper is divided into civilian waterproof zipper, heavy duty waterproof zipper,water-resistant zipper, watertight and airtight zipper. Watertight and airtight have higher requirements for waterproofing. The waterproof zipper is a type of nylon zipper and is a specially treated nylon zipper. Special treatments for waterproof zippers for sale include: PVC, TPU film, water immersion, and waterproof zipper. Nowadays, the most widely used PVC waterproof zipper is PVC. The main component is PVC. The main component is polyvinyl chloride. Other ingredients are added to enhance its heat resistance, toughness and ductility. The uppermost layer of the film is lacquer, the main component in the middle is polyvinyl chloride, and the lowermost layer is a back-coated adhesive. PVC can be divided into soft PVC and hard PVC. Soft PVC is generally used for the surface of floors, ceilings and leather. 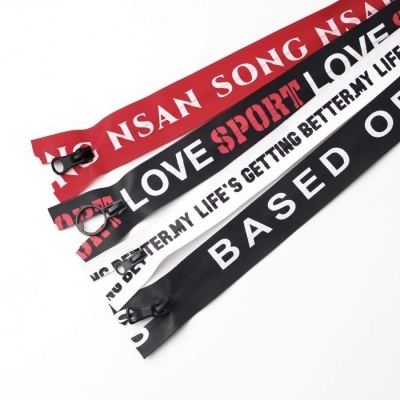 However, soft PVC contains softener (this is also the difference between soft PVC and hard PVC), which is easy to become brittle and difficult to store, so its use is not extensive. Hard PVC does not contain softener, so it is flexible, easy to form, not brittle, basically non-toxic and non-polluting, and has a long storage time. Therefore, it has great development and application value and has a broad market. There are two reasons why PVC can be widely used: First, the unique properties of PVC (rain, fire, antistatic, easy to form), and second, the low input and high output of PVC. PVC waterproof zipper is the use of PVC waterproof features. Waterproof zipper is widely used, suitable for: winter clothes, ski clothes, down jackets, sailing suits, diving suits, tents, boat covers, raincoats, motorcycle raincoats, waterproof shoes, fire suits, luggage, jackets, fishing suits, etc. Waterproof zippers closed end zip should be selected from the following aspects: Ø Waterproof zipper film does not tear. Whether it is at low temperature or repeated washing, the waterproof membrane is not easy to fall off or tear, so as to ensure the waterproof effect for a long time. Ø Smoothness, smooth to use, and greatly reduce the tensile and wear resistance of the waterproof zipper. 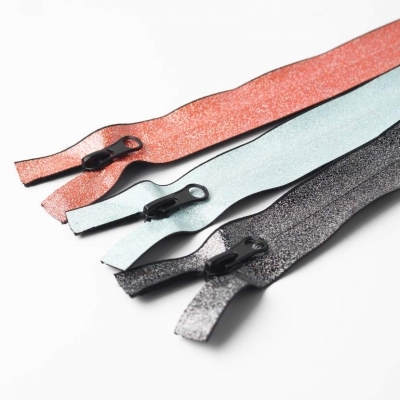 Ø Waterproof zipper film has a smooth, delicate surface and a smooth leather-like feel. This is the appearance of a high-quality waterproof zipper. Ø The color difference of the colored waterproof zipper is small. The difference between the color and the fabric of the zipper tape is the color difference, the color of the film surface and the color of the cloth surface, and the color difference is controlled within 5%. 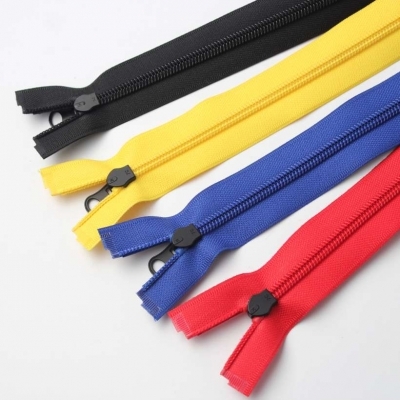 Waterproof zippers are ubiquitous in people’s life, so do you know what kinds of waterproof zippers for sale there are? According to the commonly used treatment methods, waterproof zippers can be divided into coated waterproof zippers, PVC film waterproof zippers, TPU film waterproof zippers, water-repellent soaking zippers, heavy duty waterproof zipper and so on. Now learn different style water resistant zippers below to select the best waterproof zippers like ykk waterproof zippers according to your demand. 1.TPU film waterproof zippers for sale: TPU is a new environmental polymer which is called thermoplastic polyurethane in Chinese and also known as waterproof and moisture permeable film. This is a major breakthrough in the application of the waterproof breathable fabrics which has overcome many defects of the PVC waterproof zippers. It not only has most of the characteristics of the rubbers and common plastics but also has excellent physical and chemical properties. So it is called future materials. TPU film is made of TPU granule materials by special process. It inherits the excellent physical properties of TPU and is widely used. Because TPU overcomes many defects of PVC, TPU film waterproof zippers are superior to PVC waterproof zippers in performance. To sum up, the TPU film waterproof zippers are waterproof, breathable, low temperature resistance to – 40 ℃, high temperature resistance to 100℃ and soft which are the high-end products in waterproof zippers. 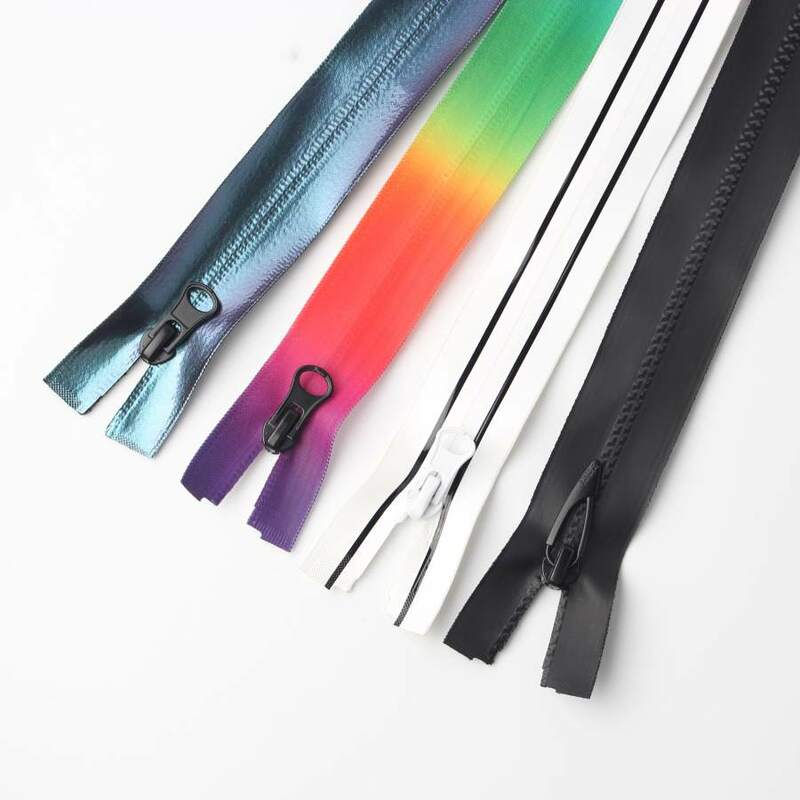 2.PVC film waterproof zippers for sale: The main material used in this product is PVC and the main component is polyvinyl chloride. Meanwhile, other components are added to enhance its heat resistance, toughness and malleability. The top layer of the film is lacquer, the main component in the middle is polyvinyl chloride, and the bottom layer is back coated adhesive. There are two reasons why PVC materials can be widely used. First, the unique properties of PVC (rainproof, fireproof, antistatic, easy to form). 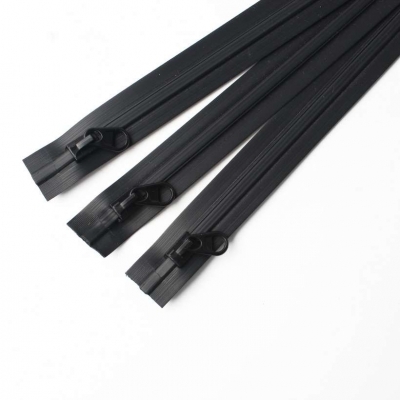 Second, the characteristics of PVC – low input but high output. PVC waterproof zippers just USES the waterproof property of PVC. 3.Coated waterproof zippers for sale: It is characterized by no shedding, no whitening, no brittleness, low temperature resistance to -70℃, environmental，soft and water resistant zippers. What are the features of the waterproof zippers? The waterproof zipper is a branch of the nylon zippers. 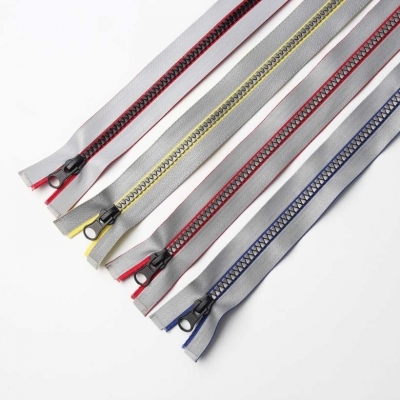 It is a kind of nylon zipper which has been specially treated. 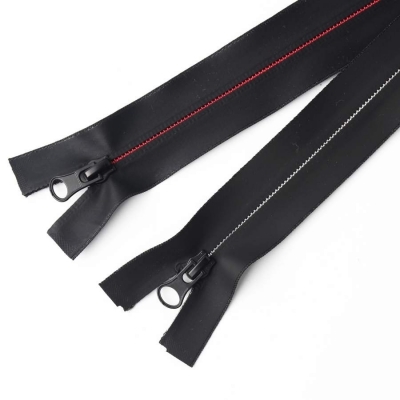 Waterproof zippers are widely used and suitable for waterproof related series of products: cold-proof suits, ski suits, down jackets, nautical suits, diving suits, tents, boat covers, raincoats, motorcycle raincoats, waterproof shoes, fire suits, case bags, storeroom suits and fishing suits. What should you pay attention to when choosing the good quality waterproof zippers? The waterproof effect. The size of the middle seam is directly related to the waterproof effect of the waterproof zippers. If the size is too big, obviously the meaning of the waterproof zipper itself loses. Film of the waterproof zip does not tear. Whether in low temperature or repeated water washing, the waterproof film is not easy to fall off or teared. Only in this way can the waterproof effect be guaranteed for a long time. The color differences of the color waterproof zippers should be small. 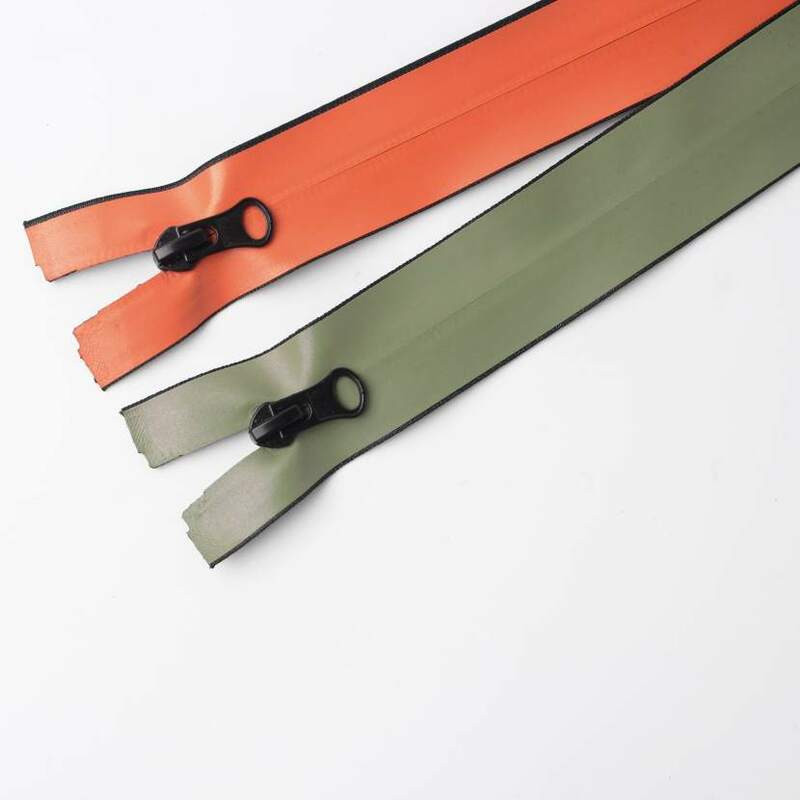 The color differences between the zipper tape and the fabric are color differences which should be within 5%. The service life The quality of the adhesive film on the waterproof zipper is directly related to the service life of the waterproof zipper. Surface of the waterproof zipper film is smooth and delicate which is the appearance of the high quality waterproof zipper. The degree of smooth It is generally believed that The smoother the zipper, the better the quality. 1. One is a waterproof film (TPU film or pvc film) to achieve waterproof effect, and the other is to apply a waterproof rubber layer on the zipper to achieve waterproof effect. 2, the zipper surface of the waterproof membrane is smooth, uniform, and has many colors. It can be bright, matt, semi-matte, etc. 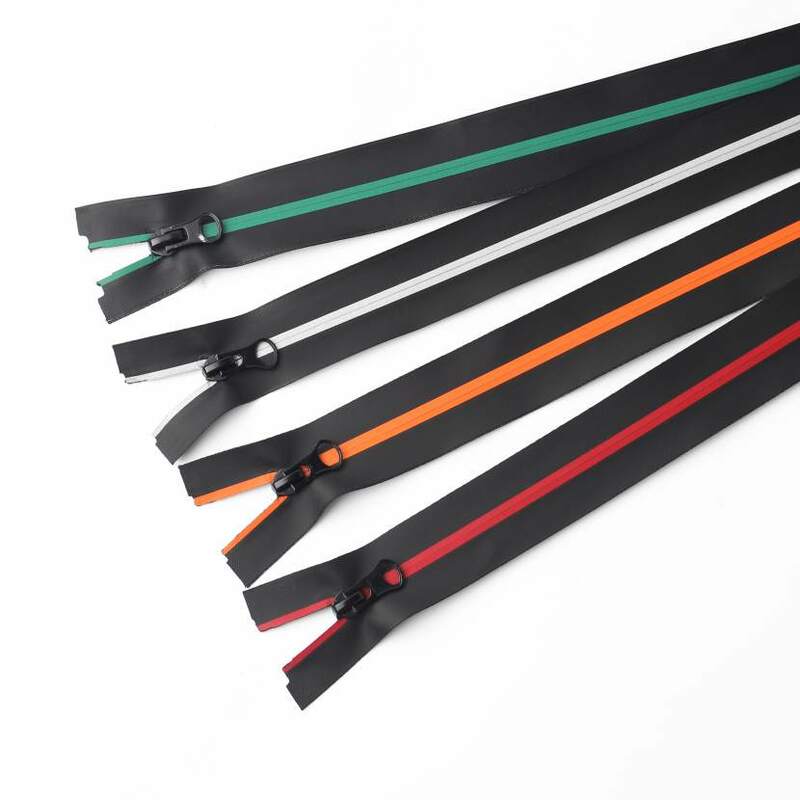 The input cost is relatively low, but the bonding strength of the film and the zipper is not very good, and it is easy to delaminate at low temperature. It is a pvc film, the effect is even worse; the coating of the waterproof zipper is not very uniform, the surface is not very smooth, but the waterproof effect is very good, the zipper is soft, the coating and the zipper tape are combined, and the investment cost of the equipment is compared. Large, less color. ES provide waterproof zippers closed end zip by the yard and you can use different heavy duty waterproof zipper for jacket or water resistant zipper for sleeping bags or ykk zippers for leather or different color like black waterproof zippers, etc. You can choose any kind of strongest zipper type from ES to meet your different requirement.